A portable application like XYplorer does not require any formal installation onto a computer. Simply copy it to any desired folder and run it from there. Thus, XYplorer can be stored on a removable storage device (such as a CD-ROM, a USB flash drive, a flash card, etc) enabling it to be used on multiple computers without requiring any sort of registration or affecting the host system in any way. Unlike the typical Windows application, XYplorer does not use the registry to store its settings. 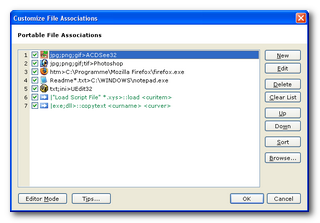 Instead it uses a set of small files located in the application data folder. When traveling with XYplorer you simply take these files along and you're at home wherever you are. In one word, it's stickware. The above also means that XYplorer is a "stealth" application, an application which leaves an absolute minimum of identifiable traces on the host computer. XYplorer can maintain any number of file associations independently of the global ones defined in the Windows registry. These "Portable File Associations" are stored in XY's configuration file and support relative path syntax (see below), which allows you to travel with your own home-grown file associations, thereby keeping the promise of thumb drive file management: Home is where your double-click is! You may associate files and folders with applications not only by type/extension, but also by name, by location, and actually by any wildcarded pattern. It's also possible to associate items with user-written scripts. The icing on the cake is the Portable Openwith Menu (POM) which is generated for the currently selected file from your Portable File Associations. Syntax 1: Use a question mark ( ? ) as drive letter. It will be replaced internally with the letter of the drive XYplorer is running from. Syntax 2: Use conventional relative path syntax to make paths relative to the current location of XYplorer.exe. 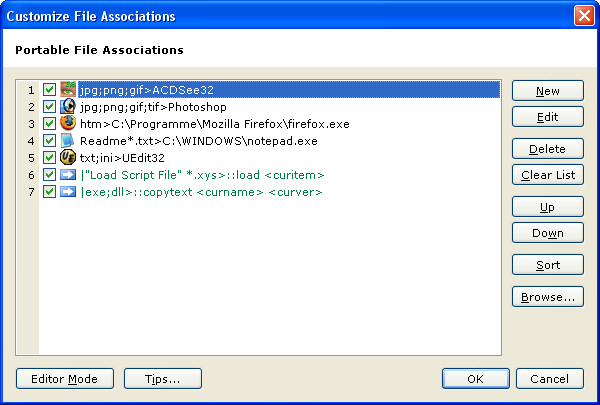 Using Portable File Associations and Application Relative Paths you can double-click a file and have it opened by the application on the USB drive rather than by an application on the host computer. This page has been written 2008-06-24. The screenshots don’t reflect the current look of the application. Some of the functionality might have been changed or enhanced in the current version.